The holidays come around every year, but for some reason, last year's desserts don't seem to cut it. 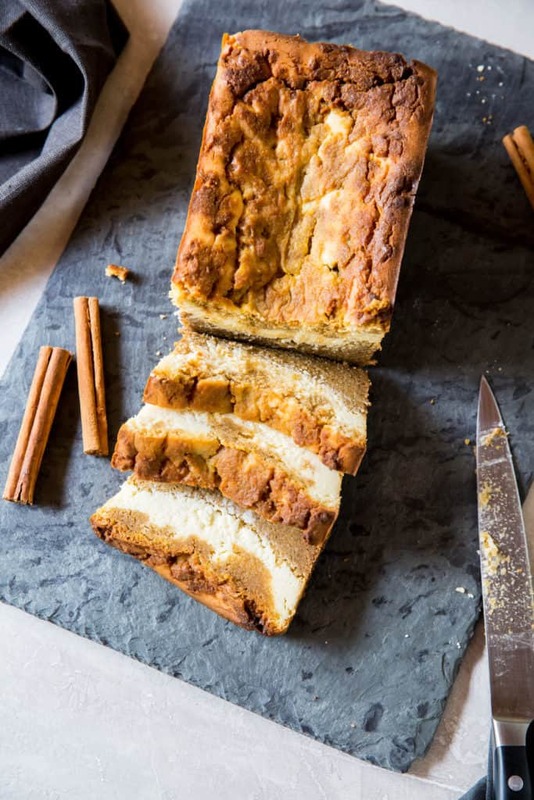 We are coming at you with this Low Carb Pumpkin Bread that has a surprise cheesecake layer right down the center. Make this for a healthy option to replace the traditional pumpkin pie this year! What makes this loaf so special? Well, it's dense and moist to the touch, the most essential aspects of a dessert bread. It also has a thick ribbon of cheesecake running through the center, so you get to enjoy two in one, pumpkin and cheesecake! It's the perfect dessert to bring to any holiday parties or gatherings to dig into after dinner without being tempted by the any of the other high-carb, sugar-filled desserts! It will satisfy your dessert cravings, plus you can have triple servings and still feel good about sticking to your diet. You Always Need A Low Carb Bread Recipe! Whether you're making low carb bread for sandwiches, desserts or just to snack on, we've got you covered in all departments. We have our Best Keto Bread made using almond flour, a rosemary garlic low carb bread made using coconut flour (for nut allergies) and we even have more dessert breads, such as our peanut butter cream cheese bread! Low Carb Pumpkin Bread For The Holidays! If it's your turn to host Thanksgiving and you're still scrambling for perfect dessert ideas. It's your lucky day! 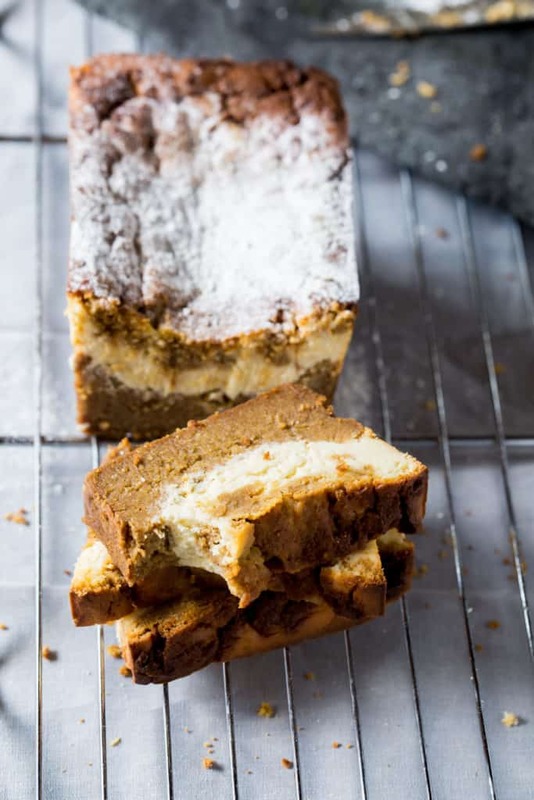 This pumpkin cheesecake loaf will steal the show at your holiday gathering, so you may want to make two. 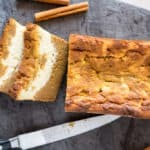 Everyone loves pumpkin and everyone loves cheesecake, so make this low carb pumpkin bread and feel good about what you're feeding your family this holiday season! Recipe can be quickly added to MyFitnessPal - Search "KetoConnect - Low Carb Pumpkin Bread"
Position an oven rack in the bottom third of the oven and preheat the oven to 325 degrees F.
Combine the cream cheese, erythritol, sour cream and egg in a large bowl and beat with a mixer until well combined; set aside. Generously spray a 9-by-5-inch loaf pan with nonstick coconut spray. Whisk together the flours, pumpkin spice, baking powder, salt in a medium bowl and set aside. Whisk together the pumpkin puree and erythritol in a large bowl, then whisk in the melted butter, stevia, vanilla and egg. Reserve 1 cup of the pumpkin batter. Spread the remaining batter in the bottom of the prepared loaf pan. Spoon the cream cheese mixture over the pumpkin batter, then put the reserved cup of pumpkin batter on top of the cheesecake layer. Bake until the top is cracked and a cake tester inserted in the center comes out clean, 70-80 minutes. Cool on a wire rack for 20-30 minutes until cheesecake layer is set, then carefully invert onto a platter or cake stand and flip upright. Let cool completely, at least 1 1/2 hours. NOTE: Make sure to check on the bread starting at 60 minutes to make sure any cheesecake layer the settled at the top isn't burning. Slightly browned is fine!